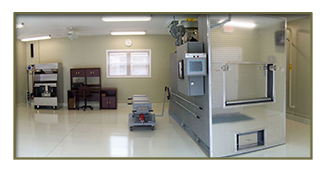 We are among the very few mortuaries in the entire state of Iowa to operate our own crematory inside our clean and secure facility. There is a huge difference between "cremation services" and "on-site cremation services," because of this we have opened our own Crematory and Tribute Center as an addition to our formal chapel at the Stuart Facility to ensure the cremation process is handled with dignity and respect. We are the only full-service funeral home in this entire area with its own on premises crematorium. With cremation choose wisely and do not rely on price only. This could be a huge mistake. We will not claim to be the cheapest nor do we want to be, but we do claim to be the best at what we do when it comes to handling your cremation needs. Remember our guarantee. If you're not satisfied with any portion of our service you will not be charged for it. Feel free to stop by anytime and let us tell you all about our unique facility and the benefits to our community of performing cremation directly under our supervision. It takes more effort to ensure that the cremation is handled with care, dignity, and high standards. To assure your loved one is being cared for appropriately, we adhere to a rigid Pre-Cremation Checklist with every cremation process. Staff members are commitment to our high standards. We encourage your personal inspection. We are also equipped if a family member wants to view the initial start of the cremation process. All of our staff members certified cremationists. We strictly adhere to a Cremation Code of Ethics, an assurance to you of our commitment to dignity and honesty. Cremation is the process of reducing the body of the deceased to fragments of bone by way of heat and flame. We prefer to say "cremated remains" rather than "ashes" because we believe that the term "ashes" can be misleading. Our funeral directors or crematory staff can explain the consistency of cremated remains in as much detail as you prefer. If you are considering scattering we would recommend you ask us to prepare you for what you will see. If the deceased is Jewish, Christian Orthodox, Muslim, or Roman Catholic, you may wish to consult clergy or our staff for guidance. For example, the Catholic Church strongly advocates the presence of the body - not the cremated remains - for the Funeral Mass with cremation to take place later. The Catholic Church does not accept scattering. Our Cremation Authorization form goes into some detail in explaining the cremation process, our policies and procedures. You will receive a copy of the completed form. It's important to know your rights and understand the cremation process. Please ask questions and find out about our commitment to providing the highest standard of care.